From the Korea University Medical College, Seoul. A 54-year-old man experienced sudden onset of severe headache 3 days prior to admission. Evidence of infection or trauma was absent. Brain MRI revealed a mass-like lesion with rim enhancement and surrounding edema in the right sylvian fissure (figure, A–C). A 0.7-cm aneurysm at the right middle cerebral artery bifurcation was revealed through additional magnetic resonance angiography (figure, D) and aneurysm rupture was confirmed under microscopy during emergent surgery. Rim enhancement could be related to the presence of vasa vasorum in the aneurysm wall or neovascularization in granulation tissue within the intraluminal thrombus.1 A round lesion with rim enhancement may be an atypical imaging feature of cerebral aneurysm. A mass-like lesion (arrow) with hyperintense signal in the fluid-attenuated inversion recovery image (A), hypointense signal in the T1-weighted image (B), and rim enhancement in the contrast-enhanced T1-weighted image (C). An aneurysm at the right middle cerebral artery bifurcation was revealed by magnetic resonance angiography (D). Drs. Kim and Jung were responsible for study conception and design and writing the manuscript. Dr. Lee was responsible for analysis and the selection of imaging. Dr. Park was responsible for interpretation of data. Dr. Kwon and Dr. Choi were responsible for study conception and interpretation of data. The Mystery Case series was initiated by the Neurology® Resident & Fellow Section to develop the clinical reasoning skills of trainees. Residency programs, medical student preceptors, and individuals were invited to use this Mystery Case as an educational tool. Responses were solicited through a group e-mail sent to the American Academy of Neurology Consortium of Neurology Residents and Fellows and through social media. Of the 9 respondents to this mystery case, only one correctly described the MRI findings in this case as involving a hypointense mass-like lesion with surrounding edema in the right temporal lobe. 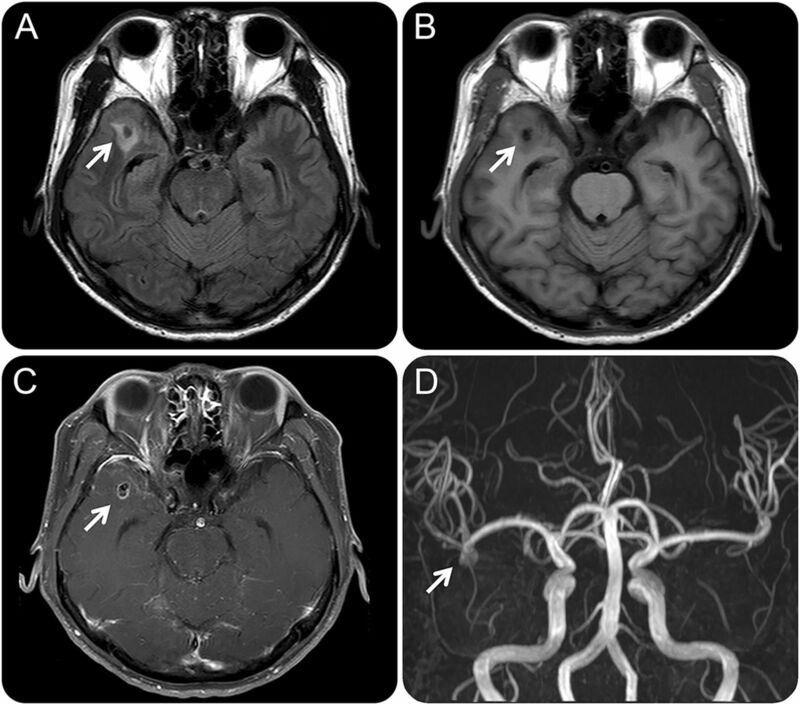 However, 4 respondents identified the presence of a right middle cerebral artery aneurysm in the patient's magnetic resonance angiography, with 2 of them also observing that the ring-enhancing appearance on MRI could be due to the aneurysm being partially thrombosed. This aneurysm was likely responsible for the patient's thunderclap-type headache. A commonly used mnemonic for causes of ring-enhancing lesions on MRI is MAGIC DR—metastasis, abscess, glioblastoma multiforme, subacute infarct, contusion, demyelination, and radiation necrosis or resolving hematoma. It helps to consider lymphoma in the differential, and as this case demonstrates, one might also add aneurysm to that list, giving us the perhaps more satisfying mnemonic of MAGICAL DR.
. Pediatric intracranial aneurysm: a diagnostic dilemma solved with contrast-enhanced MR imaging. AJNR Am J Neuroradiol 2003;24:370–372.